Home >> Providers >> Colette Bullock, D.O. 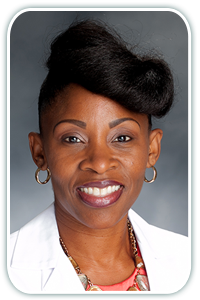 Dr. Colette D. Bullock joined North Atlanta Primary Care in 2017 and is seeing patients at our Johns Creek location. Dr. Bullock was born and raised in Bay Shore of Long Island, NY where she attended New York Institute of Technology in Old Westbury during her undergraduate years. She attended the Philadelphia College of Osteopathic Medicine in Philadelphia, PA in 2007 and completed her residency at the University of Medicine & Dentistry of New Jersey – School of Osteopathic Medicine in Stratford, NJ in 2010. Her dedication to whole person wellness cultivates her interests in Clinical Nutrition, Heart Disease, Diabetes, and Kidney Disease. Dr. Bullock is a proud member of the American Osteopathic Association, American College of Osteopathic Internists, and the American College of Physicians. Dr. Bullock lives in Johns Creek with her husband and their three sons. She enjoys running and weight lifting in her spare time. She stays true to her holistic health passions and teaches dance classes from teenagers to adults of all ages at her church.